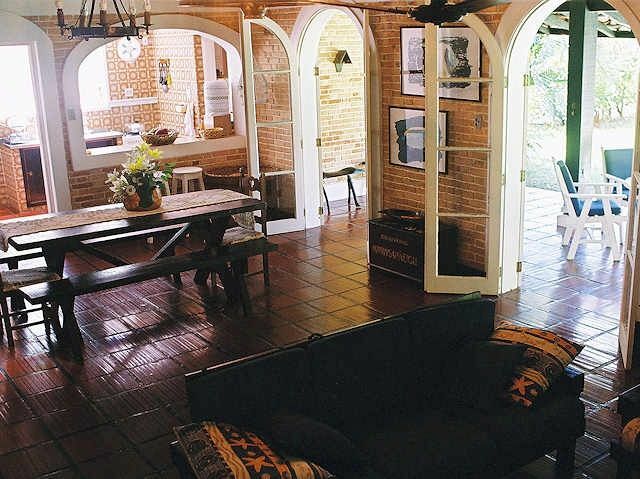 Space for parties and lease rentals in San Sebastian. House with great views of the sea, facing Ilhabela, with more than 1,500 m² of land, with 400 m² built, with his foot in the sand. A beach very quiet great for kids and for practicing sand sports like jogging, soccer, volleyball and water sports like Wind Surfing, diving among others. large and cozy living room with fireplace, separate bedroom, surrounded by terraces with gardens in front and around the entire house. Many plants and fruit trees. Kiosk with complete barbecue (sink, countertop, table, benches, lighting, fully fenced house, fence in front and in the laterals and wall. Garage and covered for 4 cars. Nine hundred meters from the front lawn of the sea. home service already residing on site who can be hired by the host at the time of your stay. If you lease the space for your party weddings, you will enjoy all that the house has thus minimizing spending on furniture leases for decoration. In the front yard were performed hundreds of weddings. Vou me casar na areia, e goataria de uma casa para ficar com a familia, entraríamos na sexta de noite e sair domingo noite!.maximo umas 16pessoas! Das 16:00 as 17:30 casamento e apos galera entra no quintal pata o jantar que durara até as 22hs depois ficamos somente as mesmas que entrar na sexta! Ja tenho outras em vista mas gostei mto desta! Beach with complete infrastructure such as kiosks by the sea, marinas, hotels, bakery.